I left the house this morning to take a nice pre-work nature photo walk around Hinckley Lake, hoping and expecting to see the low sun shining through morning haze. I also wanted to capture images of herons, imagining them backlit by that golden sunshine. As I left home it was sunny; when I got to the lake a few minutes later, the fog was so thick I couldn't see half a mile! Oh well, perhaps some moody shots. I got those and more. While I was walking the lakeside path I saw the morning's first heron arrive, searching for breakfast. 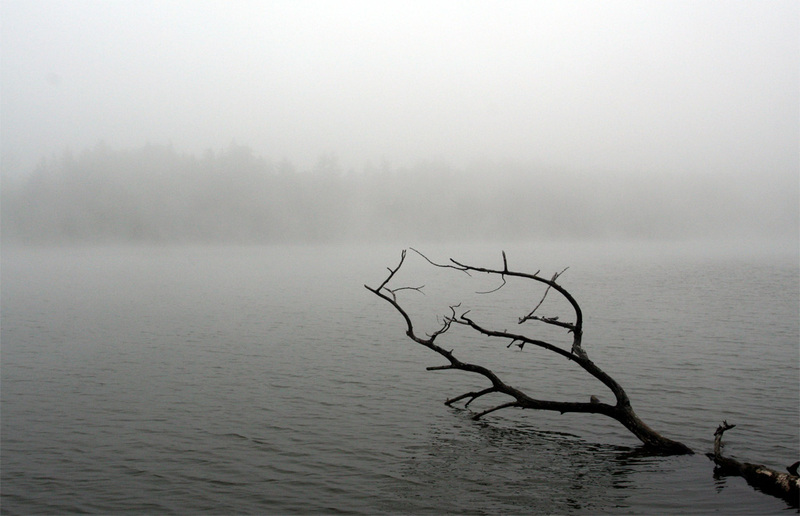 The big bird swooped down to the lake, alighted, and waded slowly in the shallows, a hundred feet or so away. I watched, shot some photos and moved closer. Herons are every bit as wild as their prehistoric look may suggest. Their call is a raspy "graaakk." They are also amazing to watch. 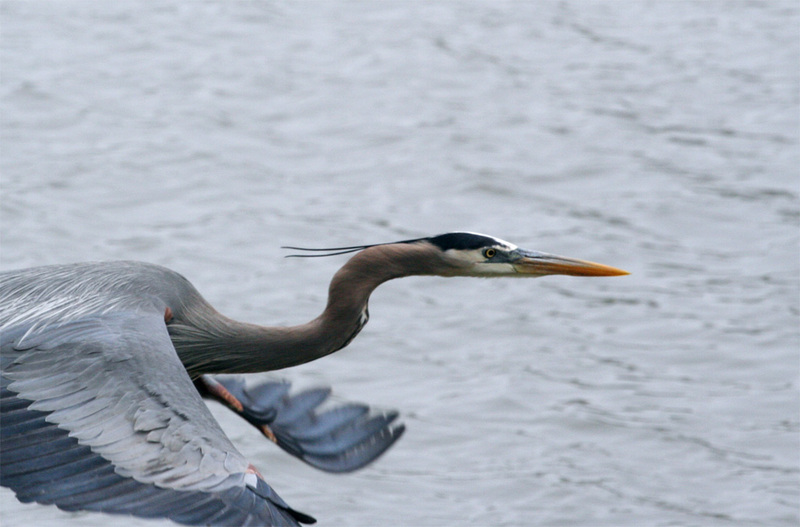 Herons' wings span many feet and a few beats lift the magnificent creatures up and away with amazing grace and speed. That first bird grew wary of the human watching and took off. I began my walk back, photographing plants and flowers along the way. I came around a curve in the path and up popped the heron, springing off the shore and into the air — I'd been distracted and did not notice the bird until it was alarmed. I continued my hike back toward the parking lot, this time watching the lake for the heron I'd spooked twice already. Yes! The bird had found a new hunting spot not far ahead of me and I approached quietly, seeking a clear place from which to photograph. As I watched, the heron stabbed at the water catching a fish. Through the brambles I squeezed off a few shots with my camera, recording the last moments of life for the fish and a life-sustaining meal for the heron. Respectfully waiting for the heron to swallowing its prey, I walked a little closer, stopped, and shot some photos. Walked a bit closer still, stopped, and shot a few more images. Finally I got close enough for a couple of full-frame portraits of our big friend and that was enough… off it went! With a few wing-beats the great blue took off across the lake. I had just enough time to roughly frame the scene, firing off three or four photos and that was it. It was a fine, if brief morning adventure. 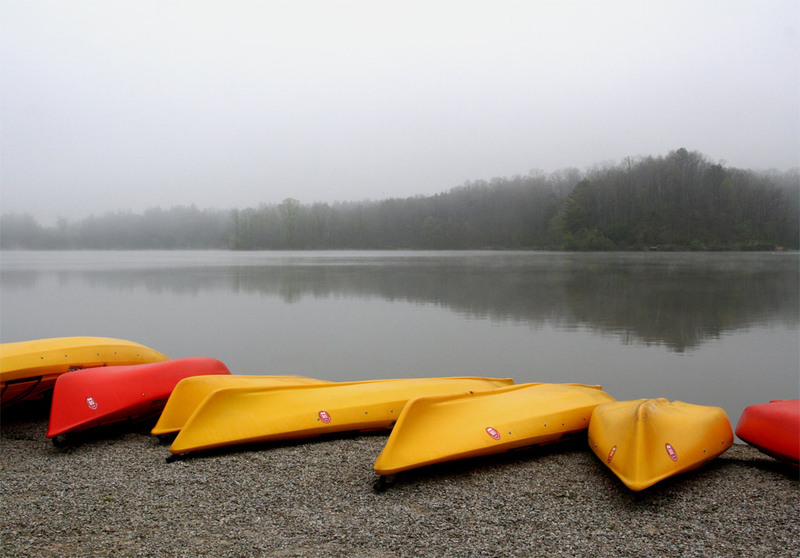 Heavy fog transforms the scenery at Hinckley Lake. I have a fine collection of shots from this morning that look like classical Japanese watercolors, even a few images with delicately colored tree blossoms floating before a moody, gray background. The fog was burning off but still supressed most colors of the lake and trees. Foreground objects, however, retained their character in fine, soft light. A line of boats awaited park visitors and sunshine that really never arrived this day. I headed home happy, even though I'd next need to head to the office. A lovely, foggy morning this was. Lovely photo of the Heron. I saw a Heron and an Egret at the same time today. Both were standing in the Maumee River at Waterville. Great shot of the heron. It must have been magical watching it feed in the foggy light. The boat shot is quite beautiful.